Someone Bought This: The Interrogator Bend 'Em figure - WrestleCrap - The Very Worst of Pro Wrestling! 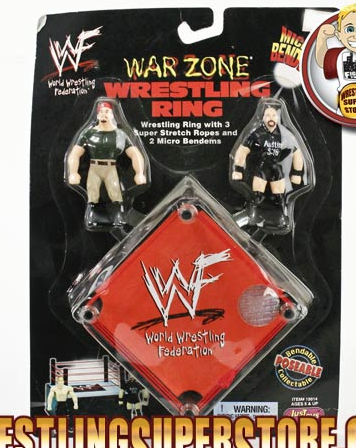 It’s a two-pack of Steve Austin and The Interrogator Bend ‘Ems along with a mini ring. To which I say “Shame on you all, Crappers!”. How could you forget The Interrogator from The Truth Commission? You may better remember his as Kurrgan from The Oddities. And now we know he’s been immortalized as a Bend ‘Em figure. 7 Responses to "Someone Bought This: The Interrogator Bend ‘Em figure"
They had to have just drawn names out of a hat to release that as a pairing. They’d be awesome in a revival of The Odd Couple, though! Or with Don Callis it’s 2 and a Half Men. I love thinking of how people come up with the assorted combo packs, and this might be the wackiest possible. I don’t think either ever crossed paths, even during Kurrgan’s short lived push that was a might-be-fed-to-Undertaker role. Am I the only person that was into The Truth Commission gimmick? Kurrgan, Bull Buchannon and the tubby one in the mask, Tank. I was into that faction. How did they not get over? 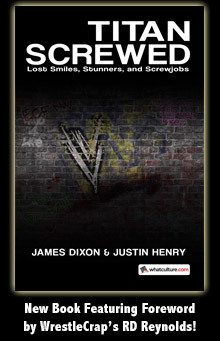 Why did they get split from their military gimmick and end up with Don Callis? Jackyl replaced the other guy because in his words -he got too soft-. Recon and Sniper soon split off when Kurrgan was getting too much love/time from the Jackyl and started a jobber tag team called Armageddon, a few weeks later Jackyl turned them into oddities before they split from him to become faces.